The Forbidden Game comes out on Tuesday, June 8, and I might as well set down the rules here. (By the way you can order the gorgeous new book on Amazon, where the rules are set out in a more legible format. The contest is for one solid 14-carat gold ring, bought for $500, but now listed at almost $700--the price of gold may have gone up. There are also two silver rings to be won. 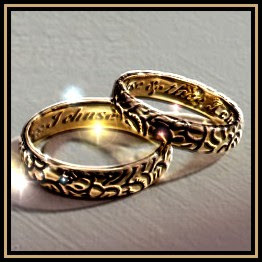 All three are poesy rings like the one in the book, which means that inside in beautiful calligraphy is inscribed "All I refuse and thee I chuse." To win send an email before August 1, 2010 to info@ljanesmith.net with Forbidden Game Ring as the subject. In the contents please give an approximate age. For you sweethearts who already know the subject matter, you may also indicate whether or not you would wear Julian's ring for Julian's sake. Who knows--it might bring you luck! I will try to put a picture of the ring below. Winners will be announced after August 1, 2010--as quickly as possible.